1. To make the sauce, blanche your fresh tomatoes until they are slightly soft in boiling water and then run them through the food mill on the tiniest hole so that no seeds will go through. Add some olive oil with whole cloves of garlic in a pot and cook until the garlic is golden brown. Add the strained tomatoes with a tied bunch of basil and cook until slightly thick. 2. While the sauce cooks, preheat the oven to 375 ℉ with a rack in middle position. 3. 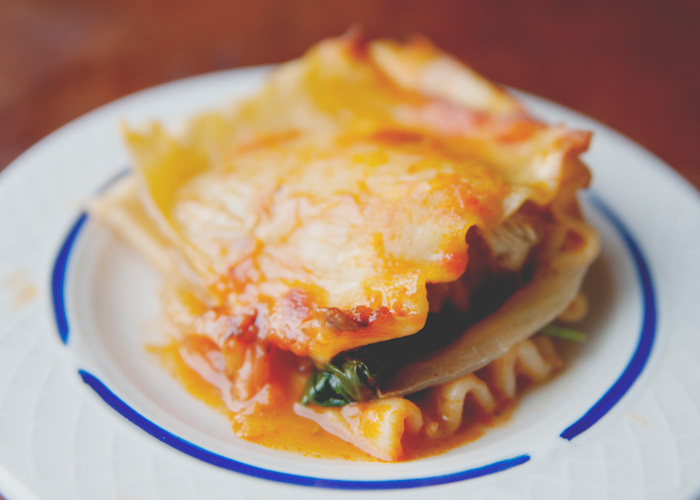 In a pot of boiling salted water, cook the lasagna sheets until al dente. Cut into thirds, crosswise. 4. Push the sausage out of the casings and sauté pan over medium-high heat, until the sausage is golden brown and cooked through, about 10 minutes. Remove the sausage, but keep the fat in the pan. 5. And onions and ½ teaspoon salt to the pan and cook until translucent, about 5 minutes. Add garlic and then spinach, a few handfuls at a time, stirring frequently, until all spinach is wilted, 3-5 minutes. Transfer to a mesh strainer and press against spinach to remove as much liquid as possible. 6. Grease a muffin tin and layer one square of pasta at the bottom of each hole. Add a small amount of the sausage, spinach and onions, ricotta, mozzarella, and tomato sauce. Add the other layer of pasta, repeat with the ingredients, top with a third square of pasta and then finish with a little sauce and mozzarella. 7. Cover with foil and bake for 30 minutes. Remove the foil and bake for another 5 minutes until the tops are bubbly. Serve warm, refrigerate, or freeze and store for a time when you need a quick snack. An homage to our favorite Rhône-style Syrahs, Funk Zone is medium-bodied, smooth, and a little spicy. We love it with pork meatballs, parmesan, ravioli... anything with marinara sauce.